"....the Kingsbury rolodex now has only one 1 entry under "Auctioneer." From our perspective the Auction went very well. While I am disappointed in not having as many "high end" items as in years past in the Live Auction – that was certainly not anyone’s fault nor for lack of trying – more related to the depressed nature of the local economy (especially the car companies). Your advice & ideas prior to the auction were very helpful & creative. Keeping the advertising budget low ($0 actually), making sure that the bigger spenders were assigned close to the stage, having the "personal stories" related to some of the live items; auctioning off the "first table sold" were especially notable. Your performance and contribution on the night of the event were outstanding. I thought that you and Howard made a great team. We appreciated you really "plugging" into and "plussing up" the energy for the evening. Many folks commented on the overall entertainment & "surprise" factor of the evening – which is testimony to your presence. You showed great flexibility and willingness to go with the flow and make adjustments on the fly throughout the evening – definitely made things easier on us – since there were a lot of moving parts. I could go on – but you get the picture. If I hear more or different at tonight's meeting, I will pass the data points along. Bottom-line was that you more than earned your fee and we are now big Kenny Lindsay fans. If you need me or us to act as a future positive reference, please do not hesitate to ask. And, I can pretty confidently say that the Kingsbury rolodex now has only one 1 entry under "Auctioneer." Thank you so much!!!!! You were fantastic and I heard a lot of good things about how you really brought the fundraiser to life! It was actually fascinating to see you at work!! His performance was remarkable! His enthusiasm was infectious along with his optimism and good humor. We simply could not have made a better choice. I wanted to take this opportunity to thank you for your part in making our first auction a great success. Many of our guests had never attended an auction and your easy and approachable manner, humor, and professionalism allowed everyone to have a comfortable and fun experience while contributing to the overall financial success of our school. I also thought you should know how appreciative we were for your handling of our guests. As a Christian school it was a step of faith to "trust" you with a microphone in front of our parents, teachers, students, and friends of our school. We are so thankful for the people that approached Lisa Rance (Vanna) and myself to express how much they enjoyed your skill and humor and wanted to know if you would be back again next year! Thanks again and may God bless you with health and wisdom. I have already heard many positive comments and accolades about our auction from both parents and staff. And, those who were unable to attend are already asking whether this will become an annual event. Not only was this an incredible fundraiser for our school, it also a whole lot of fun! I have never seen our parents, staff and Board members so excited. Thank you again for your unforgettable, generous gift. It does not occur often enough in life that someone takes the time to share his time and talent with those who are less fortunate. And, for this we are all truly grateful. Kenny, you are the greatest! The attendance at the auction exceeded our expectations and the proceeds generated were in line with our estimates. It was particularly satisfying to see that the high value items consistently brought in as much or more than we anticipated, and that all items were liquidated. Ken does a super job of presentation! "Our auction last year was our greatest success ever and I know it was because we added you and your company's expertise which helped us raise so much more money. 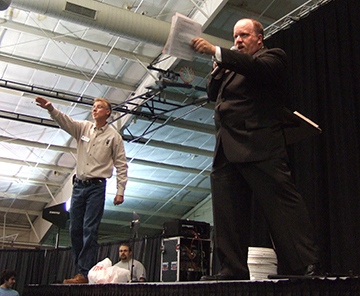 I would love to have you again serve as our professional auctioneer as we try to raise even more money." Jim Leach, Jr. Chairman, Lions Club Charities, Inc. This is a letter to recommend the services of Kenny Lindsay… As part of the logistics committee for a fundraising event for the Junior League of Ann Arbor, I had the pleasure to work with Mr. Lindsay for our live auction. His pre-event advice was excellent; he was flexible and very knowledgeable. The night of the event, Mr. Lindsay and his crew were prompt and professional. His auctioneering skills get the highest marks from us. He was fun, lively and judged the room well. We raised a substantial amount more at the auction because of Mr. Lindsay and his crew than we would have otherwise. His professionalism, sparkling sense of humor, and vast knowledge were very well received and entertaining for our audience. He contributed greatly to increasing the bidding price for our live auction items, thus helping us earn more money for our playground." Copyright ©2017 Kenny Lindsay Fundraising Auctioneers. All rights reserved. My name is Rusty Korhonen and I have been the Chairman of the Orchard Lake St. Mary's Preparatory Auction for the past five years. Our annual auction typically raise $200,000 or more. In 2014, we hired Kenny Lindsay as our professional auctioneer for our event with the expectation that he would add excitement to the live portion of and help us raise more money. 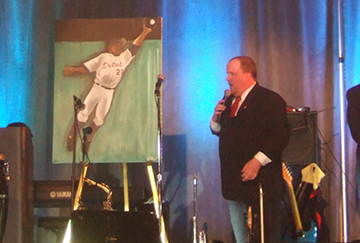 We had high expectations, and worked diligently with Kenny to put together an exciting array of live auction items. Kenny and his team exceed all of our expectations. 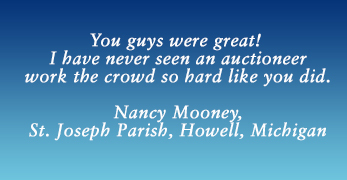 We reaised substantially more money in our live auction than in previous years, we created a level of excitement for our Live event that carried over into the following year, and we received many compliments from our patrons. The most important benefit we received from working with Kenny is a different and more professional perspective into how we run our event. I would recommend Kenny Lindsay to any fundraising event. Kenny and his team bring a level of professionalism that is impossible to provide without his experience. His live auction presence brings excitement to the event, and his professional experience brings a much deeper evaluation of how the event is run. Kenny has made numerous suggestions to us in the past three years that have made our event more efficient, more exciting, more fun, and most importantly raised more money for our organization. We have come a long way in the past four years, and I would personally thank Kenny for his big contribution to our success. We have a great team of people who work very hard every year to ensure we run a successful auction, and we consider Kenny a very integral part of our team and our success. Please feel free to contact me at any time to discuss Kenny Lindsay and his professional ringman team.